It’s been a marvellous summer of racing already and whilst many of the Flat season’s highlights are behind us, we still have the wonderful, spectacular and, frankly glorious, Glorious Goodwood to look forward to. For many racing fans, the Qatar Goodwood Festival, to use its official name, is the highlight of late summer. So, with panama hats at the ready, get set for five days of top class equine excitement, with a whopping 35 races to savour and hopefully profit from! Goodwood is located in West Sussex and is a beautiful course operated by the Duke of Richmond’s estate, nearby Goodwood House being the seat of the Duke. History and geography lessons over, let’s get onto the racing. As you would expect with 35 races, seven a day, there is something for everyone at this Festival. Since Qatar’s sponsorship of the meeting the prize money on offer has grown astronomically. That means that we frequently see the best of the best at Goodwood and with so many great races each day the Festival is right up there with the biggest and best in terms of betting opportunities. The opening day of Glorious Goodwood is – like the four that follow – a cracking day of racing. Things get started with a Class 2 handicap but we’re focussing on the two brilliant Group class seven furlong sprints that follow, as well as the feature of the £500,000 Goodwood Cup, with the defending champion looking to show his class once again over two miles. The Vintage Stakes was inaugurated in 1975, initially as a Listed race, but became a Group 3 in 1986 before being upgraded again in 2003. Open to two year olds, this has often produced Classic winners for the following year and among the 12 set to run we may have some of the stars of 2019. We currently have a couple of horses vying for favouritism, with Confiding priced at 9/2 and Dark Vision 13/2, though the latter is as short as 4/1 with some bookmakers. We strongly suspect it is Martyn Meade’s Confiding that will be sent off the favourite though and he’s the one for us. He has the raw pace which is always a danger and really impressed us on his only run, a win over six and a half furlongs at Newbury. Mark Johnstone’s two-time winner Dark Vision is greatly respected, whilst we also feel Van Beethoven may be worth each way support at odds of 10/1. Ultimately though, it’s the favourite here for us, hopefully the first of many winners for this year’s Glorious Goodwood! There aren’t too many seven furlong races of this calibre around but there are two back to back at Goodwood as the Lennox follows the Vintage. This contest is for horses aged three and above and with a total purse of £300,000 we have some top class horses going to post. The favourite is the second from the 2000 Guineas, with Tip Two Win sure to tempt many at odds of 4/1. A repeat of that Classic form would surely be hard to stop, not least as he’ll receive weight for age from some of his rivals. However, 4/1 is perhaps just a shade short for us and our tip for this one offers more value we feel. You could opt to back Emmaus each way but we think he’s worth a punt to win here. The four year old colt came back from a long break to win at Leicester back in April and the recent rains will certainly have helped. Roger Varian’s Irish raider has now won three from four and we think Andrea Atzeni can guide him to success once again at a very nice price. The Goodwood Cup was first run way back in 1808 and is in essence the race that created the Festival. There have been many changes since then, unsurprisingly, but this two mile test, the newest Group 1 at Glorious Goodwood, remains a brilliant race. Legends of the sport such as Yeats and Persian Punch are previous multiple winners of the Goodwood Cup and John Gosden’s Stradivarius looks to join them after his win 12 months ago. The bookies may just be running a little scared of the Irish four year old and at odds of just 8/13 he is very well fancied to deliver the goods. He won at York in May before landing the Ascot Gold Cup and many may well view him as the banker of the day. However, we’re prepared to oppose him here and the one to be on for us is Torcedor. Stradivarius isn’t the only class act in the race and at 8/13 we’d rather take him on. Torcedor was just a length behind the favourite at Ascot in June and we feel the shorter distance here, and potentially the rain too, mean odds of 9/2 are too big. Jessica Harrington’s six year old may need the favourite to make a small slip but that can’t be ruled out and it’s Torcedor for us. Day 2 at Glorious Goodwood sees July give way to August and one of the biggest mile long races of the season. The Group 1 Sussex Stakes is the undoubted highlight of the day and the 2018 renewal is shaping up to be a classic. The Sussex Stakes is a race steeped in history. First held way back in 1841, it has been separating the best milers since 1878 and was opened up to horses older than three in 1975. Although there are some interesting older horses in the field, this race has been dominated by three-year-olds recently and it’s a younger horse at the top of the betting in the shape of Without Parole. John Gosden’s colt has only made four appearances so far in his career and he’s won them all. Unfortunately, a minor issue kept him from contesting the 2000 Guineas but we’re very confident that Without Parole has plenty of big wins in his future. After easing back to action with a win at Sandown, Without Parole rewarded favourite backers by winning the St James’s Palace Stakes. Form from that Royal Ascot race normally stands up very well in the Sussex Stakes and given that favourites have won eight of the last 10 renewals, Without Parole is well worth backing at solid looking odds of 7/4 with Bet365. If you’re looking for an each way option for Wednesday’s big race, it’s tough to look too far past Beat The Bank at 7/1 with Coral and others. Andrew Balding trained the winner of the Sussex Stakes last year and there are signs that his four-year-old is peaking and ready for the performance of his career. Thursday is Ladies’ Day and nowhere does it quite like Glorious Goodwood. The Magnolia Cup, the unique ladies’ celebrity race, is a real highlight but the real action comes in the form of three Group level races. The Lillie Langtry Stakes is one of the newer additions to Glorious Goodwood and this year’s renewal is the first since it’s been promoted to Group 2 level. That promotion is well warranted as it always attracts quality fillies and mares with the stamina to finish strongly in the latter stages of this tiring trip. Winners in the last 10 years have ranged from odds on favourites to 16/1 shots and Thursday’s race looks as wide open as usual. God Given and Pilaster are battling for favouritism at the top of the market but it’s Frankie Dettori’s ride, Precious Ramotswe, who represents the best value at chunky odds of 7/1 with Ladbrokes. John Gosden’s four-year-old filly has winning form over this trip which is vital when looking for a winning Lillie Langtry Stakes bet. Goodwood is not an easy track for horses to get used to because of its many undulations so Precious Ramotswe’s win at Brighton at the start of the season is another plus. The Nassau Stakes is the standout race of a quality day’s racing on Thursday. This Group 1 pits together the very best middle distance fillies and mares against each other and the best of the best often triumph with the vast majority of recent winners coming from the top three in the betting. The head of the market for the 2018 Nassau Stakes includes some very well fancied horses but the price of 11/2 that Betfred are quoting about Wild Illusion instantly stands out. One of the most interesting trends of the Nassau Stakes is the impressive record of horses who compete having dropped back in trip. Each of Wild Illusion’s last two performances came over one mile, four furlongs so it is very interesting to see Charlie Appleby decide to enter her in this. Despite a decent enough performance in the Ribblesdale Stakes at Royal Ascot, Wild Illusion just didn’t look comfortable at a mile and a half. We should see the best of her back at this shorter trip so expect Wild Illusion to get the better of her main contenders, Urban Fox and Veracious. Friday’s racing at Glorious Goodwood is dominated by the Unibet Golden Mile and the King George Stakes. The former is a fiendish betting challenge which carries some great rewards for punters who call it correctly whilst the latter is one of the fastest run races of the entire season. The Unibet Golden Mile is one of a number of big field handicaps that take place every year at Glorious Goodwood. With the best part of £100,000 being awarded to the winning horse, this race is always oversubscribed and the field had to be whittled down from 54 entries to the 20 at the final declaration stage. The chance for three-year-olds to compete against their elders is one of the most interesting features of Glorious Goodwood. The younger horses have a great record in many of those big races but the Golden Mile (formally the Betfred Mile) has been won by horses ranging from three to seven in the last five years alone. Although this is a tough race to call, the trends are starting to show that punters should have a preference for those towards the top of the betting and the weights. From the top of the market it’s South Seas who most catches the eye at 16/1 with Bet365. Andrew Balding’s four-year-old is used to running in bigger field handicaps and looks ready to strike after some impressive performances. At 16/1 we would suggest an each way punt is the way to go. Glorious Goodwood has been boosted in recent years thanks to a sponsorship deal with Qatar. Prize money has increased across the board with the King George Stakes one of the main beneficiaries. There’s a prize of more than £175,000 for the winner but according to the bookies the cheque may as well be written out to connections of Battaash already. Charlie Hill’s four-year-old has not always had his way at the very top level. Despite being blessed with enormous pace he is never an easy ride so Jim Crowley has a tough job on his hands to ensure he guides the favourite home first. However, he narrowly missed out on the Group 1 King’s Stand Stakes at Royal Ascot but he should go one better dropping back in class even if he does have a penalty to carry. Kachy and Sioux Nation are both of interest as you feel they both need a win but it is very tough to look past the favourite who is available at a best price of 13/8 with Ladbrokes. That’s a price we expect to shorten in the coming days and certainly offers great value to our eyes. It’s an extremely valuable handicap rather than a Group level race that takes all the attention on the final day of Glorious Goodwood. The Stewards’ Cup always provides a thrilling contest over a short trip and there are several options for punters for this year’s renewal. Can we end the festival with one last winner in the day’s major showdown? Conquest sprang a surprise in the 2017 Steward’s Cup by winning at huge bookie-pleasing odds of 40/1. It’s not that big price winners are unlikely in a six furlong handicap with 28 runners but there’s been a trend towards the winner coming from the head of the market, with nine single figure winners in 15 years. The highly competitive nature of this year’s Stewards’ Cup means that every single horse is available at double figure odds if you shop around but it remains to be seen how long Bet365 will be offering 12/1 about Foxtrot Lady’s chances. The Stewards’ Cup is such a tough race to win that it is vital to only back horses who have strong form over six furlongs and in other competitive handicaps. That’s true even of improving three-year-olds whilst an eye-catching performance last time out is also a major plus. Foxtrot Lady combined those two trends into one with her recent win in the Bet365 Handicap at Newmarket and she is the one to beat for us. Having already shown she could compete in this sort of race when finishing fifth of 20 at York, Foxtrot Lady showed her stomach for a battle by edging out Stormbringer by a nose at Newmarket. Andrew Balding was delighted with his filly’s run and has no hesitations about trying to keep this form going by entering her in the Stewards’ Cup. It’ll take a very good performance to stop Foxtrot Lady from winning again. Summer and flat racing go hand in hand. For many racing fans there is nothing quite like enjoying the sun whilst taking in a selection of top class racing and hopefully winning some money from the bookies. When it comes to summer time there is nothing quite like Glorious Goodwood. Set in West Sussex, just north of Chichester, Goodwood Racecourse is a stunning place at all times of the year but never is it more resplendent than late July/early August when Glorious Goodwood (officially the Qatar Goodwood Festival) takes place. As well as everything that goes along with it, the five day meeting includes a host of top class horse races including prestigious Group level races and some ultra-competitive handicaps. The three biggest races of five days of Glorious Goodwood are without doubt the Sussex Stakes, Nassau Stakes and the Goodwood Cup. They’re of the calibre that many of the leading trainers will specifically target the best of their string at them and each is incredibly popular with punters. The Goodwood Cup is the star attraction of the opening day of Glorious Goodwood. This Group 1 offering is run over a distance of two miles and often attracts the very best stayers on the flat to compete for a healthy prize fund which reached half a million pounds in 2018. Like some of the other best races over the five days the Goodwood Cup is part of the British Champions Series which only helps to strengthen the field. Although it is a very important race in the long distance division, the Goodwood Cup often allows promising stayers to show just how good they are. That was the case for both Big Orange in 2015 and Stradivarius in 2017 who used the race as a springboard to even bigger wins. The Goodwood Cup is a tough test of stamina so it is interesting to note that runners coming into the race on the back of an extended break do not have a great record. You don’t want to be backing horses who have not run within more than 45 days of the Goodwood Cup. Moreover, most winners claimed at least a top three place last time out which speaks to the calibre of horses sent to Goodwood by their trainers. Every punter will assess the form from Royal Ascot when making their picks for Glorious Goodwood but that is a strategy that works better on some races than other. The Sussex Stakes is one of those where Ascot form tends to hold up, especially when it comes to three year olds who have been competing against older horses in this Group 1, one mile contest since the addition of four year olds in 1960 and even older horses in 1975. Three year olds remain the dominant age group in the Sussex Stakes but recent years brought an increasing number of older winners. By the time that Frankel became the first horse to win the Sussex Stakes twice in 2012 we had become accustomed to seeing winners and four and above and each of the 2017 and 2018 renewals were won by seven year olds. Opening up the race to older horses has done wonders for the prestige with which it’s held by racing fans and the prize money has increased commensurately to the point that it reached £1 million in 2018. Successful older horses almost all come via the Queen Anne Stakes at Royal Ascot whilst the key race for three year olds is the St James’s Palace Stakes. The other important thing to mention is that favourites have a strong record but that too has changed a little in more recent years. Like the Sussex Stakes, the Nassau Stakes is a chance for three year olds to take on their elders but this Group 1 race is open only to fillies and mares. It’s run over one mile, one furlong and 197 yards and is another race where class tells and the top of the betting market tends to dominate. It is very rare for a horse outside of the top three in the betting to claim the win and favourite backers have tended to profit from recent renewals. The Nassau Stakes is one of the most historic races that take place at Glorious Goodwood. It was first run all the way back in 1840 when it was named as a gesture of friendship between the 5th Duke of Richmond, who owned Goodwood Racecourse, and the House of Orange-Nassau. The race has changed a bit over the years. It has had the age eligibility changed, the distance changed and was only promoted to Group 1 level in 1999. There are a few trends to consider when trying to pick the winner of the Nassau Stakes in addition to the record of younger horses. It is a sterner test than the official yardage suggests so horses dropping back in trip should be favoured. For that reason Oaks form tends to hold up well while those who have tasted success in the Ribblesdale Stakes at Royal Ascot often go one to be winners here. As with any horse racing festival worth its salt, Glorious Goodwood has a mixture of races throughout the five days. Punters know that every race provides opportunity whilst true racing fans look way beyond the Group 1s at Goodwood for their fix of entertainment. The Group 2 Lennox Stakes is a chance for three year olds who may be yet to find their feet at the top level to contest a prestigious race against older competition. It’s one of the newer races at Goodwood having been introduced in 2000 but quickly caught the imagination as it was promoted from Group 3 level in 2003. Horses aged from three to seven have won this seven furlong contest since its inception. That is a slight change from the Beewsing Stakes which the Lennox Stakes replaced but the majority of winners at Goodwood were aged either three or four. This tends to be quite a tactical race but the most important attribute is finishing speed as shown by Breton Rock when claiming a surprise 50/1 win in 2017. The Golden Mile Handicap has gone under a few different names in recent years but remains one of a few devilishly difficult handicaps for punters to try and wrap their heads around during Glorious Goodwood. 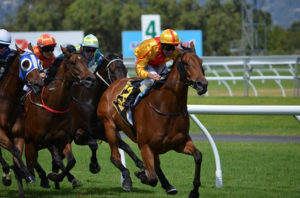 It’s the sort of race that is readymade for each way betting due to the big field, the high number of potential winners and the amount that luck in running plays when deciding a winner. This is also a race in which the draw plays a big role in proceedings. Generally speaking you would want your horse to be drawn lower than 12 but that can change if those likely to set the early pace are drawn high. The healthy prize fund means competition for a place in the race is so high that three year olds struggle to get a run but younger horses do have a decent record when given a chance. The King George Stakes is the fastest race of the week at Glorious Goodwood. Run over a distance of just five furlongs this Group 2 sprint is a real blink and you’ll miss it affair which used to be known as the Audi Stakes. The specialised nature of these short distance sprints mean that the leading contenders of the King George Stakes will often face each other multiple times over the course of the season. That helps to provide compelling storylines in the build up to the race and some thrilling renewals. The winning time has been under one minute since 1994 with Rudi’s Pet holding the record at 56.01 seconds. The Stewards’ Cup is the biggest betting heat of the week. This super competitive handicap is run over a distance of six furlongs but is no straight forward sprint. It is always an incredibly tactical contest which is why a certain amount of experience in big field, short distance handicaps is vital. That’s true even of younger horses as even recent three year old winners had been tested in this sort of contest before. The specialised nature of the Stewards’ Cup and the amount of previous form and trends to go on means that the market tends to be very good at sorting the wheat from the chaff, especially when the draw is made. That is not to say that long odds shots cannot win just that single odds winners are becoming increasingly common. This Group 2, seven furlong race is a chance for younger horses to take to the stage at Glorious Goodwood. The Vintage Stakes is often used by leading trainers as a yardstick to measure their potential Classic contenders and has been won by Galileo Golf and Highland Reel in recent times. The Gordon Stakes is one mile, three and a half furlong race for three year olds which is held on the final day of Glorious Goodwood. It’s a Group 3 contest which often includes horses who go on to compete in the St Leger with nine horses winning both over the years. Some of the biggest names in training have won the Gordon Stakes but nobody has matches Sir Michael Stoute’s tally of 10 wins. The Glorious Stakes has undergone a number of changes since it first became part of Glorious Goodwood in 1979. It became known by its present name in 1989, was closed to horses younger than four in 1993 and was promoted to Group 3 level in 2008. With a prize fund in excess of £100,000 it’s a well-regarded race which is run over one mile, three furlongs and 218 yards. Named after the Duke of Richmond and first run in 1877, the Richmond Stakes is a six furlong, Group 2 race for juvenile colts and geldings. Like many of these high level races for two year olds many winners have gone on to win big things whilst some have faded into obscurity. The history of horse racing in Britain is a long and storied one and Goodwood Racecourse has played an important role in it. The West Sussex course has been hosting horse races for over 200 years and whilst almost everything that goes around the Sport of Kings has changed immeasurably, the simple thrill of watching finely tuned thoroughbreds chase each other home remains timeless. The third Duke of Richmond is credited with creating Goodwood Racecourse in 1802. In those early days it was used by officers of the Sussex Militia for a two day festival which quickly blossomed to a vital local annual event. The third Duke of Richmond used to compete as a jockey and whilst the current Duke retains a watching brief he still works hard to keep the entire Goodwood Estate a world class venue for racing fans from far and wide.